Dr. Kwame Anthony Appiah arrived at Princeton in 2002 after spending several decades teaching at other prestigious universities: Harvard, Duke, Cornell and Yale. Dr. Kwame Anthony Appiah—arguably the nation’s most prominent black philosopher—has decided to give up his endowed professorship at Princeton University and will join the faculty at New York University in January. Appiah, 59, will hold a joint teaching appointment in the philosophy department and the law school, and has been tasked with teaching at the Manhattan campus, as well as offering occasional seminars and courses to students enrolled at many of the university’s international campuses, like the ones in Abu Dhabi and Shanghai. After 11 years as the Laurance S. Rockefeller Visiting Professor for Distinguished Teaching at Princeton, Appiah said that the offer to join NYU was appealing. In the years since he burst onto the national scene as a scholar seriously committed to the study of African and African-Americans, Appiah has been credited with stimulating serious conversations both in and outside of academe. His best-selling books, In My Father’s House: Africa in the Philosophy of Culture and Cosmopolitanism: Ethics in a World of Strangers, have been widely praised by other academics. He has been lauded for his ability to make philosophy wholly accessible to the masses. 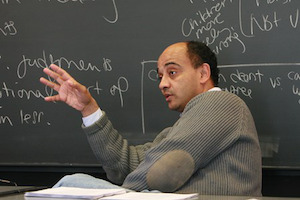 “Anthony Appiah is the leading African philosopher and the most brilliant philosopher in the Academy,” says Dr. Henry Louis “Skip” Gates, Jr., the Alphonse Fletcher University Professor at Harvard University and the founding director of the Hutchins Center for African and African American Research at Harvard. The two have been best friends since 1973 and their professional career paths have followed a similar trajectory. In 1999, they edited Africana, the encyclopedia of African and African-American experience — a work that Dr. W.E.B Du Bois had started and was trying to finish at the time of his death in 1968. This is not Appiah’s first teaching stint at NYU. Several years ago, he spent a teaching leave at the university where he taught law students and had a positive experience.